it's my girls' world: It's Friday!! Happy Friday, everyone! Here a list of just a few things that have brought a smile to my face… but truth be told, really don't warrant an entire post. 1- I've spoken about this before but if you're an online shopper and haven't jumped on the eBates bandwagon- you're totally missing out. 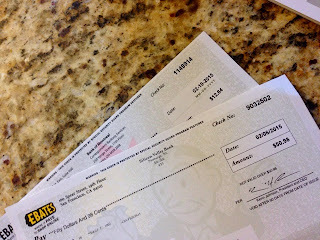 There's no catch... really no catch… and look what I got in the mail both from eBates and eBates.ca. It seriously is free money! 2- I received these lovely belated cards from my brother, sister in law and baby nephew amidst all the mail- In Canada our mailbox is down the street together with everyone else's mailboxes and in this weather I didn't check it for a couple weeks. 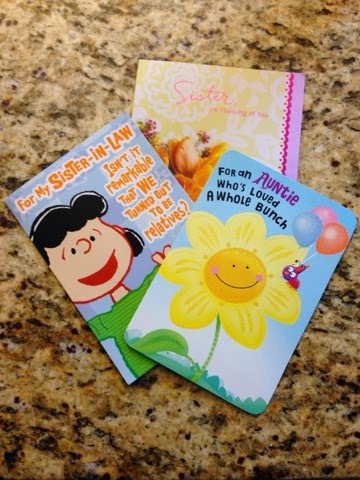 Nothing makes me smile like an unexpected card or package….especially from some of my favourite people. I can't wait for them to come to Canada in June for a WHOLE year- my brother got a fellowship! We are beyond excited. 3- We are seriously thinking about a Disney cruise this summer. We are not huge cruisers but they come very recommended. Any advice, internet friends? Book Synopsis- Velvet is odd. Instead of dolls that talk and cry, Velvet brings a milkweed pod for show and tell. She wins the class art contest using only an eight-pack of crayons. She likes to collect rocks. Even her name is strange-Velvet! But as the school year unfolds, the things Velvet does and the things that Velvet says slowly begin to make sense. And, in the end, Velvet's classmates discover that being different is what makes Velvet so much fun. 5- Who here loves Makeup Forever. Their pigments and colours last… well forever… not quite but longer than others out there. 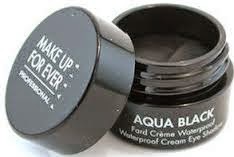 I bought this amazing gel eyeliner from them for a smoky eye and so far it does not disappoint. Does not smudge excessively like the regular pencil but also doesn't give that hard line that liquid eyeliner does. And there you have it. Have a wonderful weekend, everyone! What the heck, I have never heard of this ebates thing.. checking it out pronto! Have a great weekend! Yay for ebates! I don't shop online as much as I used to so I haven't gone on there but I love the concept. 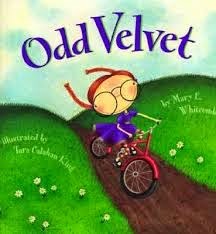 I LOVE Odd Velvet! It is such a sweet and purposeful book! I love makeup forever! They have the best stuff! Just signed up for ebates! Never heard of them before, but free money is always welcome :) Odd Velvet sounds like a really cute book. I'll look for it next time we're at the bookstore/library. Happy Friday! I got $85 this last check. I'll check out that book, we're always looking for new fun books to read! Love ebates!! Have to start shopping the ca site too! Cute book. As a teacher-librarian I am totally checking that out! Have a great weekend! Stopping by from the linkup. My best friend just went on a Disney Cruise and loved it! She said it was overwhelming and crowded the first day, but she's so glad they went and would definitely do it again! Enjoy your weekend! I had some friends do a Disney Cruise and they LOVED it.